To introduce students the fundamentals of CAD Geometric modeling, capabilities of CAD packages, CAD approach for design problems & Artificial intelligence. 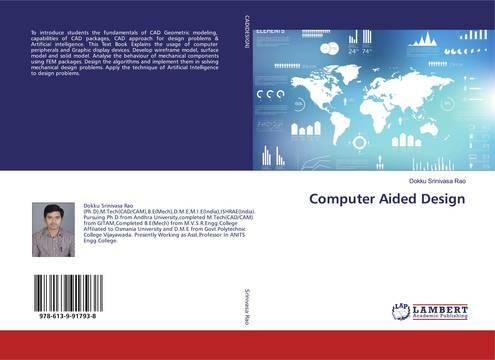 This Text Book Explains the usage of computer peripherals and Graphic display devices. Develop wireframe model, surface model and solid model. Analyse the behaviour of mechanical components using FEM packages. Design the algorithms and implement them in solving mechanical design problems. Apply the technique of Artificial Intelligence to design problems. Fundamentals of CAD, geometric modeling, Capabilities of CAD packages, CAD approach for design problems, Artificial intelligence.